Card of the Day ~Make A Wish~ What do you most desire? What does your soul long for? This card asks you to get in touch with your deepest wishes and send them to Heaven, instead of deciding that they’re not possible. 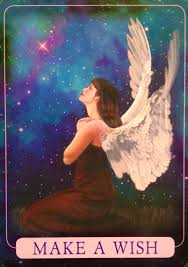 The angels call upon you to use your Indigo power of attraction to create good in your life rather than hiding it under a pile of doubt. This is an exciting card, because it means you’re close to what you desire. You just need to exert a bit of energetic effort to help create it in your life. When you receive a message like this, it’s normal for uncertainty or fear to arise. Just take a deep breath and allow your exhalation to release this lower energy from you. Have a silent conversation with your angels, in which you share with them exactly what you desire in life. One of two things will always happen: (1) you’ll get your wish; or (2) you’ll be shown a better, more suitable answer. We all can have our dreams come true no matter who we are so please turn to your Angels now and talk to them about your wishes. Have a most blessed day. I love you all!